1. 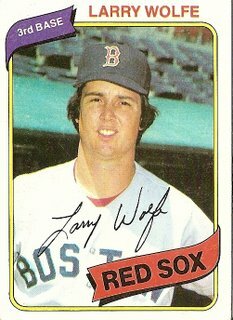 Larry Wolfe was living in a van at the time the baseball card people surveyed him. As his profound chinlessness precluded him from enlivening his van-bound nights with female accompaniment, Larry Wolfe had ample time to absorb the lessons embedded in the babble from his portable television, lessons which perhaps reached their most concentrated distillate in the car advertisement phrase “fine Corinthian leather,” a notion invented by ad executives to avoid using just the definable but syllabically-challenged word “leather.” Fantasy Island‘s Ricardo Montalban spoke these words when describing a Buick, and perhaps the mellifluous, exotic lilt of the voice of Montalban, the man who every week taught the likes of Tom Bosley and Shelley Winters important lessons by spiking their deepest fantasy with setbacks that peaked at twenty and forty minutes past the hour, drifted deep into Larry Wolfe’s being, and when he was asked where he lived by a Topps functionary perhaps Larry Wolfe responded in the emptily inventive voice of Tatoo’s overlord, Larry Wolfe a man of his times, mimicking the invention of glamour to wallpaper grim reality. 2. Upon reaching the big leagues, a hopeful Larry Wolfe was immediately victimized by a Glengarry Glen Ross type of real estate scam. In this theory, there is a Rancho Cordova, but it is a desolate expanse of sand and scorpions. P.S. The brakes soon went out completely on the El Camino. The moped hit .244 in 1979 and .130 in 1980 and by 1981 was one way or another living year-round in Rancho Cordova. You are currently browsing the archives for the Larry Wolfe category.